Knowing that I was correct all along is a nice feeling. What was I right about? Pat and Kate Flanagan are buried at Tulocay Cemetery and so are all of their eight children. The disappointing thing is that Pat and Kate have unmarked graves along with four of their children. At $1600 for a basic marker, I am not in a position to change that right now. In my past and even today, I have often thought about burial and to an extent, for lack of a better word, the waste that it brings. I don't want to sound disrespectful or anything but instead rather practical from an environmental standpoint. However, bear with me as I may have changed my mind some on this point after having worked on my family tree over the past year. The casket, the expense of burial, the land (plot), and the whole process, seemed so extravagant to me in the past even when I helped with my own grandfather's funeral planning. The metal caskets that are painted whatever color you want almost remind me of old car colors including powder pink and blue. Depending on what you believe, the cost seems a bit much knowing that the spirit of the person is no longer there and just a body remains. Mind you, my grandparents' caskets were beautifully finished oak. Anyway, I could go on. What I have changed my mind about is having a place, a location that memorializes the person. If we have a place like that, the person will not soon be forgotten along with their story. That is my hope for everyone. It seems to me that some of the Flanagan's of Napa, California, had been forgotten by much of the family.....not by everyone....but by some.....while some have yet to discover their Flanagan roots. My hope is to preserve some of the information. Below is a photo of where Patrick, Kate, Agnes, Edward, Ignatius, and Leo Flanagan are all buried. 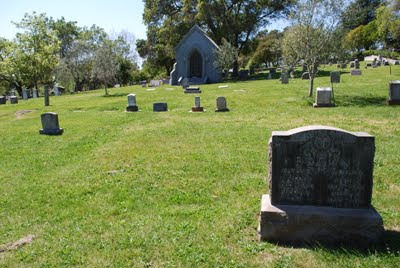 While it may not be much to look at, it is where they were laid to rest just left of the Brown's. I must add to my comments here about the Flanagan's though. As I mentioned previously, if you can have some delight in visiting a solitary and sometimes rather mournful place such as a cemetery, pleasant surprises are always welcome. So that I can find Pat and Kate Flanagan's burial location again, I decided to snap photos of graves that surround the plot. The Brown's are located right there but I have no idea who they were and if they were known to the Flanagan's. I did find some other interesting headstones though.